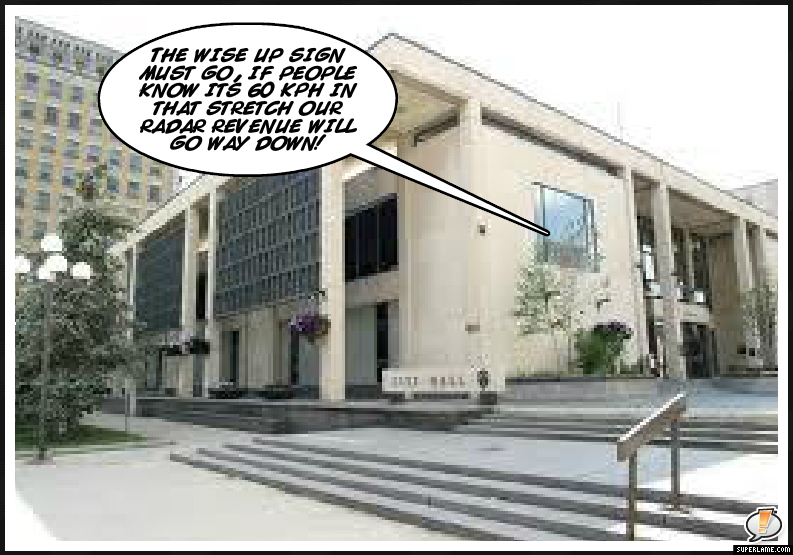 This entry was posted in Cartoons and tagged City of Winnipeg, Photo Radar, Winnipeg Police Service. Love it! How accurate is THAT!! It’s the same mind set that penalizes drivers for flashing their lights at oncoming traffic to alert fellow travellers to the presence of speed traps. The end result (assuming the speed limit is being exceeded by users of the other lane, not a given) is a possible reduction in velocity and a more attentive posture which should be applauded, but not if it results in a decrease in tickets issued apparently. It is all so obviously about revenue. Accuary is very important, as you point out with your analysis of the WPS annual report. The same accuracy should be found in your reporting. The zone in question, where the unauthorized warning sign was erected was not and has never been enforced by photo radar. Mobile photo radar can only be operated in immediate proximity to schools, play grounds, parks etc. Although I have never viewed political cartoons as “reporting” in the strict sense of the word, I have none the less changed the wording from ‘photo radar’ to ‘radar’ and noted the change at the bottom of the post.